Jung Won (정원) is a Korean barbecue restaurant in Tanjung Tokong, next to the main road to Mount Erskine. Food is served in all-you-can-eat buffet style. The price is RM39.00 for adult and RM22.00 for child. At each table is a stove where customers cook most of their food. In the indoor dining section, the stoves are fueled by cooking gas. Outdoor ones are powered by burning charcoal, so I recommend that you dine outdoors if you do not mind the absence of air-conditioning. The griddle is tilted to allow excess oil to drip out. Pork is the main delicacy at Jung Won. Samgyeopsal (삼겹살) is essentially unmarinated pork belly. 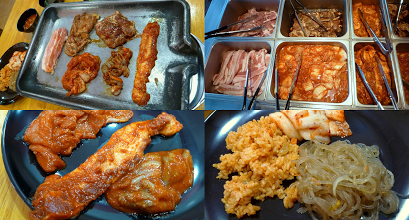 Marinated pork choices are Dwaeji Galbi (돼지갈비) and Dwaeji Bulgogi (돼지불고기), seasoned with gochujang (고추장) and soy sauce respectively. If you do not take pork, you may try dak galbi (닭갈비, marinated chicken) instead. Nakji (낙지, baby octopus) is also nice. Typical condiments such as lettuce, onion, garlic and ssamjang (쌈장) are provided. The Korean way of enjoying barbecued meat is by placing a piece of meat on lettuce, add condiments such as ssamjang and garlic, and then fold the lettuce into a pocket before eating the entire piece. This Korean barbecue buffet includes a number of side dishes called "banchan" (반찬). Baechu Kimchi (배추김치, napa cabbage kimchi) is probably the most widely known banchan. Meanwhile, Japchae (잡채) is translucent noodle made from sweet potato flour. Kimchi Fried Rice (김치볶음밥) is also nice. Other Korean delicacies are Dak Bokkeum (닭볶음, spicy braised chicken), Kimchi Jeon (김치전, kimchi pancake) and Gimbap (김밥, seaweed rice rolls). Gochujang Jjigae (고추장찌개) is a popular stew made from kimchi, pork and tofu. Should you prefer something non-spicy, Miyeok Guk (미역국, seaweed soup) is available too.